Located in beautiful downtown Saskatoon, Saskatchewan, Canada TCU Place is considered to be one of the best conference facilities in Western Canada. With over 104,000 square feet of convention space, this facility is one of the most versatile properties in Saskatoon. The Convention Centre houses 21 different rooms with configurations that allow unlimited combinations. In addition to the 21 rooms, the conference centre also houses a 2,003 soft seat theatre that can be utilized for a larger plenary.TCU Place specializes in conferences up to 1,500 delegates, gala banquets, and tradeshows of up to 120 booths. The facility features many rooms with 19’ ceiling heights and many rooms have natural light. Meeting planners will experience superior technical support and state-of-the-art audio visual equipment. Our in-house catering is renowned in the industry offering unique and varied menus for all tastes and budgets. TCU Place is located close to many tourist attractions and services. A variety of hotels and over 400 restaurants and retail stores are located within walking distance. 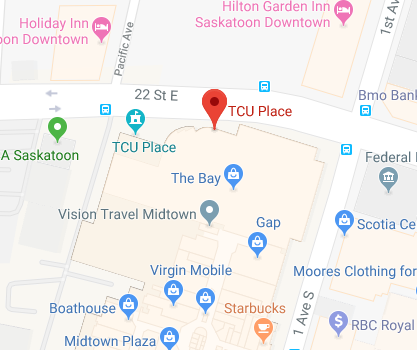 The Saskatoon Airport and the University of Saskatchewan are both located within a 10 minute drive from the conference centre. 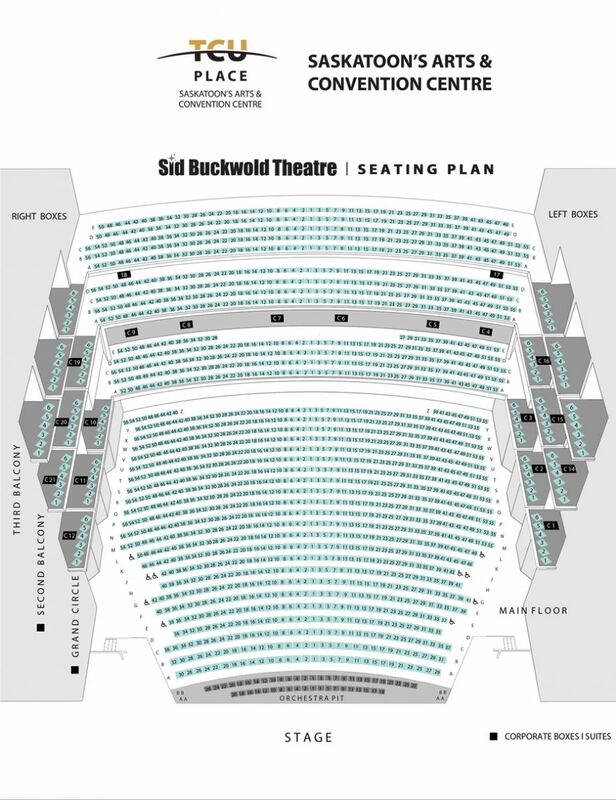 Located within TCU Place, the Sid Buckwold Theatre is a three-tier theatre with 2003 seats. 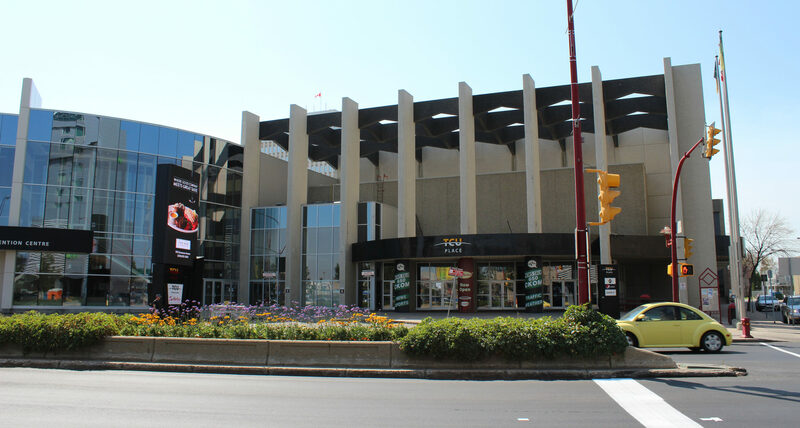 Built in 1968, this facility has hosted international and national performers, speakers and theatrical productions. The theatre is well known for its superior acoustics and expansive stage area. There are seven dressing rooms, luxurious artist amenities, and a Green Room. Experienced technical staff are located within the facility. TCU Place is fully wheelchair accessible with ramps, elevators, and accessible restrooms. Accessible parking is available at the front of the building, and in adjacent parking lots. Dedicated wheelchair seating is available in the Theatre (limited number of seats). This requires a ticket and is priced according to the performance. Tickets for wheelchair seating are only available through the Box Office – email inquiries@tcuplace.com or phone Box Office at 306-975-7799. Assisted listening devices are available to borrow for all Theatre shows. There is a limited number available which is assigned on first-come-first serve basis. Contact our Box Office for more information. Children booster seats are also available to borrow for all theatre shows. Limited number available. Please ask your usher when being seated. We are proud to offer a City of Saskatoon FADS-certified barrier-free restroom with universal accessibility. It is located on the main floor directly next to the Box Office.